Versatile, multi-function, state-of-the-art design shower spray, it can be used for all your irrigation needs and even for cleaning work. Equipped with four different jets that you can select simply by rotating the front part. The handy push-button system allows you to adjust and shut off the flow of water with a simple movement, without tiring your hand and directing the jet with the utmost precision. 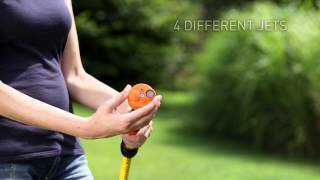 Lightweight and compact multifunction lance with aerator. Ergonomic horizontal grip with shallow-angled outlet. Handy front-mounted push-button mechanism for controlling and shutting off the water flow. 2 flow settings. Rotate the head to get 4 different jets: shower, concentrated, aerated, mist.